The annual FabricLink Network's Top 10 Innovation Awards are presented to exceptional textile-based materials and technologies that have launched during the past year and are commercially available. 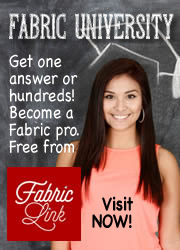 FLN recognizes the research and development effort required to create new products for the specialty fabric markets. The FabricLink Network's Top 10 Innovation Awards honor the companies and researchers who develop the innovative textile products that drive our industry. This year's Top 10 winners include: Innovative manufacturing and production technologies; Novel insulation solutions; and Advancements in textiles for a variety of markets. Looking for this year's winners? Check them out here. Breaking new ground in thermal insulation—warmth, without the downsides, 3M™ Thinsulate™ Featherless Insulation offers 600 Fill Power protection. Its loose fill down alternative mimics or surpasses the performance of natural down in fill power, loft and performance when wet. Made of durable, lightweight polyester fibers, 3M™ Thinsulate™ Featherless Insulation provides warmth without a single feather. Fill power measures the volume, in cubic inches, that an ounce of insulation creates at maximum loft, typically rated on a scale from 450 to 800+. The higher the fill power, the lighter, fluffier and more insulating the product is. Using this measurement, 3M™ Thinsulate™ Featherless Insulation provides a rating of 600 Fill Power. With a high focus on product development, 3M continues to broaden its portfolio of insulation products. 3M™ Thinsulate™ Featherless Insulation is 3M's latest development to keep the wearer at the forefront of outerwear design. Freudenberg Interlining introduces the first nonwoven polyester lining material made from independently certified biodegradable fibers. 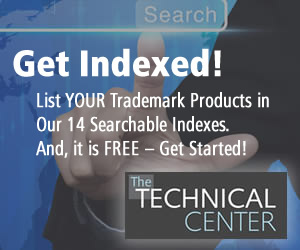 The Freudenberg linings have been tested and certified according to procedures and standards developed by Hohenstein Institute, a worldwide textile research, testing, and certification organization. Hohenstein scientists have developed the test methods to evaluate textile biodegradability from every angle. Using ISO standardized soil burial tests, Hohenstein scientists define a textile's decomposition behavior—how long it takes, what elements remain, and the effect on surrounding water and soil. Additionally, ecotoxicological analyses using marine bacteria, water fleas, fish eggs, and other biological systems determine the potential risks the degrading fabric poses to the environment. Hohenstein thoroughly tested Freudenberg's nonwoven polyester linings and found them to fully meet the criteria for their "Biological Degradability" certification. Now apparel made with Freudenberg linings will have a less intrusive impact on the environment at the end of its useful life when it is discarded in a landfill. This economically, environmentally friendly erosion armoring technology, developed by Watershed Geosynthetics, Alpharetta, Georgia, is designed to reduce construction and long-term maintenance costs in geotechnical applications. HydroTurf combines a modified woven engineered synthetic turf with a high-friction geomembrane locked into place with a specially designed HydroBinder™ high-strength infill. HydroTurf offers the aesthetic benefits of vegetation with the performance and maintenance benefits of hard armor. Since it has a lower carbon footprint, HydroTurf is a more sustainable solution than other hard armor revetment systems. HydroTurf is used in the following applications: Overwash/overtopping protection for levees and embankments; Lining for drainage channels, swales, and canals; Overtopping protection for spillways and slopes on dams; Shoreline protection within basins and impoundments for reservoirs; Mechanical stabilization for earth walls; and for cart paths, drainage channels and lake banks on golf courses. HydroTurf is available in two system configurations: HydroTurf™ CS for high velocity conditions, and HydroTurf™ Z for less critical applications involving lower velocities and flow conditions. 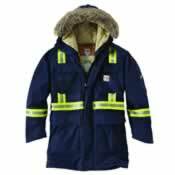 Mount Vernon FR and Carhartt, America's premium work wear brand since 1889, launched Carhartt Flame-Resistant (FR) Extremes™ Arctic outerwear. The Extremes Arctic line offers wind resistance, durability, warmth and comfort to workers in extreme weather conditions, without added weight or bulk. The outer shell of the Extremes Arctic line is made from an abrasion-resistant 9-ounce FR canvas, using Mount Vernon F's AMTEX™ PLUS cotton/high-tenacity nylon FR fabric. Ideally suited to extreme working conditions, Extremes Arctic uses Carhartt's proprietary Wind Fighter™ technology to provide protection from the potentially dangerous effects of wind chill. 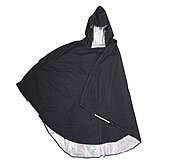 Unique features of the line, made up of a parka, coat, biberall and hood, include lightweight insulation for superior warmth without the bulk, FR Sherpa lining to trap air and maintain warmer core body temperature, hi-vis reflective trim for safety, multiple utility pockets for convenient storage (12 total), large, mitten-friendly zipper pulls for ease of use, and inner radio pocket with pass-thru for mic and cord. Outlast Technologies, the leader in phase-change materials (PCMs), launches 'Universe' - a PCM viscose fiber and down blend filling material. The heat and moisture regulating PCM viscose fibers combine perfectly with down to offer a natural solution for climate comfort – great for use in outerwear. In warm climates, the Outlast® fibers absorb excess body heat. As the climate cools, the fibers release the stored heat back to you– working to proactively manage your temperature. While incorporating Universe into a product offers added value and performance, it can also reduce the costs compared to using 100% down. The down adds advantages like lightness, fluffy volume and naturalness, while the Outlast PCM viscose fibers regulate and optimize the climate comfort - resulting in a light filling material that keeps you warm while reducing overheating and sweating. Developed by Swiss company Schoeller Textil AG, the new schoeller®-WB-400 soft-shells with memory foam are offered in natural shades like warm beige tones and neutral stone grey for Winter2016-17 for a trend combining nature and technology. The jacket fabrics in fluffy wool looks are ideally suited to round cuts, as well as voluminous looks that always return to their original shape and do not crinkle. Schoeller®-WB-400 soft-shells with memory foam are ideal companions in autumn or winter. 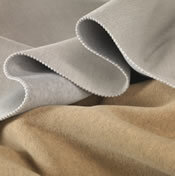 These elastic, comfortable all-round Schoeller fabrics are sustainably produced in Switzerland. With functions such as breathability, moisture transport, water repellence and heat retention, these qualities are long-lasting and supersoft companions in sports and leisure. The wearer is kept nice and warm during winter times by the voluminous double fabrics with cosy fleece on both sides. Conclusion: In multifunctional soft-shell clothing, you are always appropriately and comfortably dressed. Teijin Aramid (Arnhem, The Netherlands) together with a research team at Rice University in the USA, have developed carbon nanotube (CNT) fibers with performance properties, far exceeding those of the competition. The fibers are "wet spun" from liquid crystalline dispersion of CNTs in super acids. That process is known to be scalable, because it is similar to that used in producing rayon, Twaron® and Kevlar®. The CNT fibers feature the high electrical and thermal conductivity performance of metals, combined with added textile flexibility, robust handling and tenacity. Due to the novel combination of properties, CNT fibers have great potential to inspire new developments in such industries as aerospace, healthcare, automotive, electronics and smart clothing. Current end-uses include lifesaving, conductive sutures for heart patients; lightweight data cables for satellites, aircraft and high-end cars (by replacing copper wires); high quality interlink audio cables; conductive sewing yarns; electron sources for digitally accessible X-ray sources; and thermal links for cooling space devices and advanced garments. Aramid anti-ballistic fabric with conductive stitches connecting a battery, switch, and fan. Developed by Chicago-based AFM Heatsheets®, Ultraflect™ is an innovative, reflective, lightweight (35 GSM) polyester woven insulation fabric. While reflective insulation technology isn't new – inducted into the Space Foundation's Hall of Fame in 1996 and used as protection from the extreme temperature changes of outer space – AFM Heatsheets' new DWR-coated Ultraflect™ with Silver Lining® technology translates the products originally developed for space environments into today's demands for comfort, convenience, style, and function. With a single reflective-insulation layer, Ultraflect™ provides protection in a more compact form. The fabric incorporates an ultra-thin, soft, and durable reflective-insulation membrane laminated to familiar woven fabrics to deliver exceptional protection from the burning rays of the sun, or to stimulate warming. Ultraflect's™ goal is to provide stream-lined solutions that impose little change to the appeal of the host fabric in outward appearance, drapeability and launderability. Ultraflect™ is an ideal insulation for performance wear, outdoor fashion apparel, and shelter products (i.e. sleeping bags, tents, emergency bivvys, etc.). VOORMI®, an innovator of domestically sourced Precision Blended Wool, is proud to unveil the future of weather protective textile technology. CORE CONSTRUCTION™ Technology ushers in a new age of weather protective fabric construction that delivers the first true single-layer fabric to contain an integrated weather-proof membrane. CORE CONSTRUCTION™, the most recent in a line of breakthrough fabrics from VOORMI, represents a major shift in weatherproofing technology: transitioning from decades-old lamination and coating technologies to the integration of weather resistant barriers and other functional cores directly into textiles. CORE CONSTRUCTION™ Technology refers to a new process of co-constructing knit textiles around "functional cores" — often a waterproof membrane. During development, VOORMI may fine tune water resistance and airflow to perfectly match the textile's properties with the product's intended use. In practice, CORE CONSTRUCTION™ Technology will unlock previously impossible or improbable apparel and textile possibilities. CoolVisions®, a disperse-dyeable polypropylene fiber produced by FiberVisions®, has added WoolVisions™, an intimate blend of dyeable polypropylene and wool, to its range of superior performance products. Unlike other wool/polypropylene blends, in which different yarns are knit together in a fabric, wool and CoolVisions® yarns are intimately blended into a single dyeable yarn, many of which are 60% merino/40% CoolVisions® polypropylene, which maximizes the performance potential of each yarn in the content. As a disperse-dyeable, staple synthetic fiber, CoolVisions® is ideal for spinning with fine-micron merino wool, offering color and design options unavailable with solution-dyed polypropylene and wool blends, as well as providing an exceptionally soft hand. Available for both woven and knit constructions, the WoolVisions™ yarn raises the bar for 'natural performance' fabrics by offering a host of advantages over 100% wool or wool that is blended with other synthetic fibers. CoolVisions® polypropylene has a better thermal performance than other synthetic fibers—cooling when it is warm and retaining heat when it is cold.